These little peppers are about an inch long and very hot. Green ones are not ripe, and red are ripe, but you eat either one and mix them together for color. 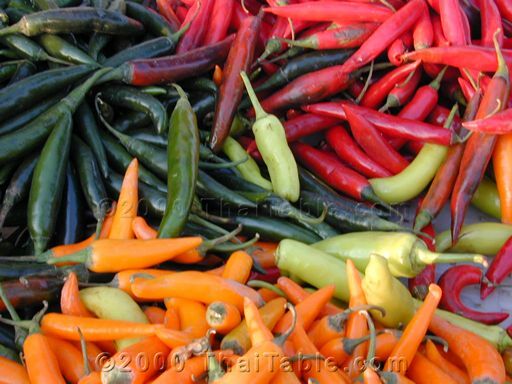 At the end of Summer, I would get the Thai chili peppers from Farmer's market, wash and let air dry. Then I would put them in the freezer and freeze them for later use. They seem to last the whole year. Although, toward the end of the year, they seem to lose the heat. Otherwise, the peppers are as good as fresh. These peppers are widely available at Asian markets, Farmers' market and some supermarkets. They can be grown in the US successfully in the Summer. The plant likes heat and sun. Red ones are sometimes sun dried, toasted and ground then put on the table as a condiments. Traditional southern Thai sauce served with rice and many veggies. Fried crunchy mung beans spiced with green onion and chili pepper.